Shu Fen Wung’s patients love her and she loves them right back. A nurse scientist with a decades-long research interest in cardiovascular disease, she has a serious compassionate streak for the elder patients she sees in the community during her clinical work. “I tend to like people who are older,” she says with a smile. 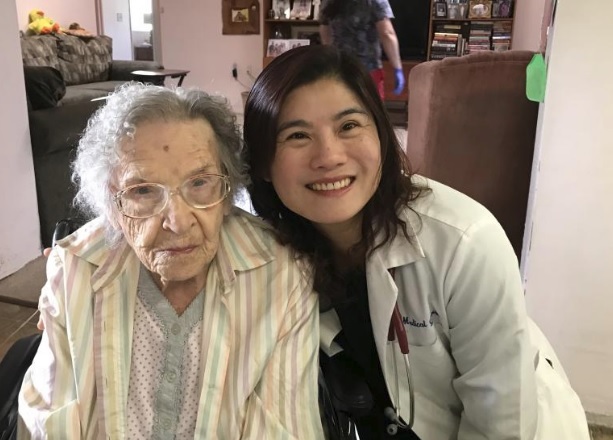 “I value their wisdom.” And her patients, whether they live in an adult care facility, assisted living or their own home, treasure the personal, compassionate care that she provides. A certified acute care nurse practitioner since 2003, Dr. Wung has been conducting community visits for 14 years. Many of her first patients – several of whom are in their 90s and 100s – are still with her. “My oldest one right now is 107 and I had several others who lived to 106,” she says. Dr. Wung’s community practice is as multi-faceted as her patients, many of whom are low-income or on Arizona Health Care Cost Containment System (AHCCCS) care. Her in-home work encompasses managing ventilators for patients with chronic respiratory failure, feeding tubes for nutrition needs for patients with traumatic brain injuries, and IV infusions for patients who are dehydrated. She also works with medical equipment companies to secure wheelchairs, walkers and shower chairs, coordinated services with pharmacy, hospice and other home health care nurses, and consolidates and manages multiple medications. What she loves most about her job, though, is building long-term relationships with her patients. “The most rewarding part is being able to help them make decisions and to solve their problems, whether it is related to their health conditions, social issues, nutrition, safety or basic needs,” she says. “I treat them as my family.” She also enjoys raising the College of Nursing’s profile in the community, pointing out that patients give her complete trust because of her association with the UA. She’s proud of taking care of patients not only because of the warm human connection she makes with them, but because her community practice feeds into how she teaches her students at the College. “They’re the people who will carry out the work that I foster for future patients,” she says. Shu Fen Wung, PhD, MS, RN, ACNP-BC, FAAN, is as Associate Professor at The University of Arizona College of Nursing.